Standing by a table spread with books, prayer cards and tiny Blessed Teresa of Kolkata holy medals, Sister Mary Tessilina, a Missionary of Charity, playfully draped an edge of her iconic, blue-striped sari over 22-year-old Anna Romportl’s forehead. For a moment, the college senior caught a glimpse of herself as a veiled member of the order. A parishioner of St. Michael in Stillwater studying at the University of Wisconsin-River Falls, Romportl is discerning a vocation to religious life, she said, which is what drew her Feb. 8 to Minneapolis’ Phillips neighborhood to the converted apartment building to see how the Missionaries live, work and pray. The Missionaries were among 10 religious communities in the Archdiocese of St. Paul and Minneapolis that participated in a nationwide Day of Open House with Religious, sponsored by the U.S. Conference of Catholic Bishops’ Committee on Clergy, Consecrated Life and Vocations, and the nation’s three religious leadership conferences. In the archdiocese, communities opened their doors to the public for three hours Sunday afternoon. The Missionaries invited their visitors to spend time in Eucharistic adoration before joining them in a room with a long table, chairs and information about religious vocations. 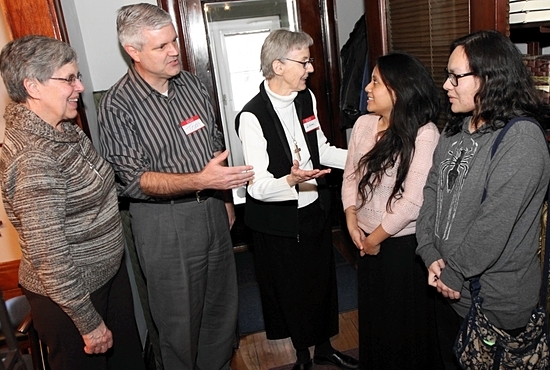 Mikaela Gaworski, an eighth-grader at St. Joseph School in West St. Paul, said she knew “a little bit” about the Missionaries of Charity, but went to their open house to learn more after learning of the event at a Feb. 7 vocations-focused NET Lifeline event. Peggy Gaworski sat at her daughter’s side. Several of her children are considering religious life, she said, but as a parent, she neither “encourages nor discourages” a religious vocation, she said. The Missionaries of Charity approached their open house with a similar spirit. Sister Davis Kuruppseary, the local superior, said they hoped the open house glorified God, and inspired their visitors to do God’s will, whether or not it led them to join their community. “It’s not what we do and what we say, it’s that many answer the call of Jesus,” she said. Five miles away, Visitation Sisters opened the doors of their North Minneapolis monastery to guests, chatting with them over cider and cookies. Visitors included several people not discerning religious life. John and Dori Wozniak, 64-year-old parishioners of St. Joan of Arc in Minneapolis who live nearby, saw the open house as a way to meet the sisters for the first time and learn more about their outreach. The Minneapolis monastery is one of constant invitation; neighbors stop by daily looking for conversation, household items and prayers. It also attracts young women considering religious life; the day before, they hosted a 30-year-old discerning God’s call. “Opening our doors is very natural,” said Visitation Sister Katherine Mullin, the community’s vocations director, adding that some women seek them out just to know religious sisters. “It’s in relationship that young women will find the community that they are called to, whatever that is,” she said. Other local communities hosting open houses were the Dominican Sisters of St. Cecilia, Stillwater; Franciscan Brothers of Peace, St. Paul; Franciscan Clarist Congregation, Vermillion; Franciscan Sisters of Little Falls, Minneapolis; Missionary Oblates of Mary Immaculate, Buffalo; Missionary Sisters of St. Peter Claver, Woodbury; Order of St. Clare, Bloomington; and Pro Ecclesia Sancta, St. Paul.